This was my first cruise and my partner&apos;s fourth cruise, but first on Norwegian. I had expectations of a crowded buffet with flavor similar to that of Golden Coral. I was pleasantly surprised to find the food at the buffet (Garden Cafe) as well as their main dining rooms (Taste and Manhattan Room) were excellent. Each day their food choices were new, everything was fresh and had great flavor. The entertainment on board was excellent. The cruise director was awesome and fostered an environment of fun and relaxation. The room was clean, well laid out and well decorated. The fitness center had so much equipment and the view was amazing! The shows on board were excellent, they offered a circus, a musical, a comedy magic show, a ballroom dance performance, dueling pianos and many many more live options. The itinerary included, Naples, Rome, Pisa, Cannes and Palma Majorca and Barcelona as well as one sea day. Honestly, the sea day was one of my favorite days because we had so much fun on board the ship. The only areas were I would offer some ideas to improve are: 1) a bigger pool. The Epic has three water slides which were really fun, but the pools on board a smaller. 2) I wish there had been clearer instructions on how far the ports were from the train stations and transportation if guests were not participating in excursions. I give Norwegian&apos;s staff 5/5 stars, the food 5/5, and the entertainment 5/5. Really excellent trip. 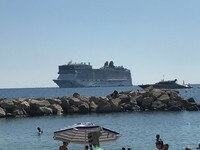 Norwegian Epic anchored at Cannes, France. This was my first cruise and my partner&apos;s fourth cruise, but first on Norwegian. I had expectations of a crowded buffet with flavor similar to that of Golden Coral. I was pleasantly surprised to find the food at the buffet (Garden Cafe) as well as their main dining rooms (Taste and Manhattan Room) were excellent. Each day their food choices were new, everything was fresh and had great flavor. The entertainment on board was excellent. The cruise director was awesome and fostered an environment of fun and relaxation. The room was clean, well laid out and well decorated. The fitness center had so much equipment and the view was amazing! The shows on board were excellent, they offered a circus, a musical, a comedy magic show, a ballroom dance performance, dueling pianos and many many more live options. The itinerary included, Naples, Rome, Pisa, Cannes and Palma Majorca and Barcelona as well as one sea day. Honestly, the sea day was one of my favorite days because we had so much fun on board the ship. 1) a bigger pool. The Epic has three water slides which were really fun, but the pools on board a smaller. 2) I wish there had been clearer instructions on how far the ports were from the train stations and transportation if guests were not participating in excursions. I give Norwegian&apos;s staff 5/5 stars, the food 5/5, and the entertainment 5/5. Really excellent trip. We had an inside cabin. I was worried that I would feel cramped and closed in, but in reality it was a really nice room. The bed was spacious and the bathroom, shower and closet was positioned in a way that made the room feel open. For an inside room, I think they did a great job with the design. Our cabin staff was awesome. They kept everything clean and were so friendly and helpful. Barcelona is one of my favorite cities in the world. This port has so much to offer from food, to historical sights. I would give yourself a few days in Barcelona before your cruise departs. This was my favorite port of the trip. Cannes is beautiful and has amazing beaches. At this port, the ship anchored off short and you take small boats to the short (tendering). We didn&apos;t have to take a train on buses anywhere, but instead did some shopping, ate amazing food and enjoyed the beach. Some of our new friends from the cruise went to Monaco and had a good time. I did hear from a couple that they did an excursion that went to Monaco, Nice and Cannes, but they said it was too much traveling and they didn&apos;t get to enjoy one place for very long. I recommend picking Cannes or Nice and just enjoying it. It&apos;s so pretty. We saw Pisa at this port. The train was easy and only took about 20 minutes or so. We had a great meal at Pisa and enjoyed walking around. You can walk from the train to the leaning tower, but they also have buses for a low cost. Some people on our ship saw Florence and said it was amazing. Others stayed in Livorno and had a great time as well. One caution at this port, you need to take a shuttle to get to the train from the port. Norwegian offered a $15 shuttle excursion that we took. It was easy. The cruise offered excursions to Capri and Pompeii, but we opted to see Napes on our own. The port is right in Naples so no need for trains or transfers. Naples had some neat sights to see. We visited a lot of historical churches, a castle, and enjoyed Pizza! Naples is home of Pizza. While this island looked beautiful, we were wiped out and decided to stay on the ship at this port. We had a great time relaxing and enjoying all the fun stuff to do on the ship. Our friends went and did a cliff diving excursion. They had a great time. The island was beautiful and looked really inviting. We elected to visit the Vatican on our own. While Rome and the Vatican were awesome to see, I would highly recommend taking the cruise up on their excursion offer for this port. IN order to get to the train, you had to take a shuttle. Then the train took over an hour to get to Rome. We lost a lot of time traveling on this day. While it was an adventure and fun for us, it would have been more relaxing and gave us more time to take one of the Norwegians excursions at this port.